Our Personal Trainers are experienced, well educated and are available from open to close. When it comes to working out, the friendly encouragement of one of our Personal Trainers can help you take your fitness to the next level. Glenn Heilig - College level education in anatomy, physiology, kinesiology, biology and chemistry. Current certifications with ACE as a Certified Personal Trainer, Nutrition Consultant, CPR and AED. Twenty six years experience working in the fitness industry. Rijkent Zwaan - ISSA & Westside Barbell Rule of 3 Youth Training Certified. Specializes in Strength & Speed Performance, Functional Strength Development and overall improvment of physical fitness for any age. Mark Wolf - Specializes in Interval Training, Core, Balance, Flexibility and TRX Training. Sport Specific TRX Certifications. Clarissa Best - NETA Certified Specializing in muscular strength and range of motion, weight loss and toning/sculpting. Melissa Shore- Experienced in training individuals with various limitations as well as the aspiring athlete. Specializes in Weight Training, Running, Cycling, Kettlebell, Tabata, High Intensity Intervals, Yoga and Pilates. 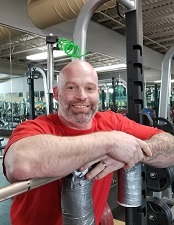 Roman Beck- Licensed Physical Therapist Assistant and ACE Certified Personal Trainer specializing in strengthening and therapeutic rehab.